Imagine bringing the quality and charm of eighteenth-century wood planks into your home today. With reclaimed wood, you can do just that. Reclaimed wood is lumber that’s been salvaged from old homes, barns, mills, and other industrial buildings as they’re being dismantled. The wood is literally hundreds of years old—the trees may have grown for 200 years or more before falling or being cut for use in buildings that were constructed 150 years ago. They have a strength, beauty, and quality that’s simply not possible to find in today’s lumberyards. Preservationists and architects have long loved using reclaimed wood in restoration projects. Now these old woods are becoming more available to homeowners, as speciality milling companies are recovering and remilling them for sale. They are especially stunning when remanufactured into wide-plank flooring. 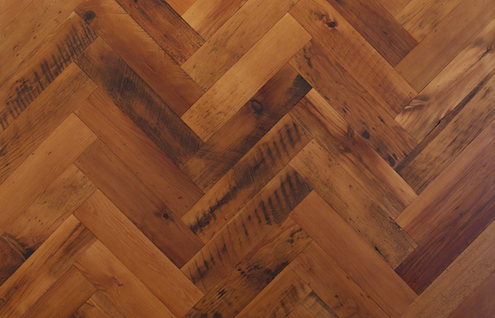 Some of the reclaimed flooring even comes with certification that authenticates the origin of the wood and guarantees that is was responsibly reclaimed. These floors will add a touch of class and old-world charm to any home.